The destination for romanticism, of evocative and unique landscapes; for some years now, Puglia has become the destination of choice for happy couples around the world to celebrate their wedding. With its unspoiled nature, its crystal clear sea, its tradition for culinary excellence, the history very much alive today, embedded in the architecture and in the customs of a population with ancestral origins, it is Puglia which provides a dramatic backdrop for a bride and groom celebrating one of the most important days in their lives. Puglia has participated in some of the most romantic “I do’s” ever declared by a couple. But which are the most beautiful locations to celebrate ones nuptials? By far the most desirable places to get married in Puglia are the masserie, renovated farmhouses built in a rural-style, typical of Puglia, Southern Italy and above all Apulia. Established during the reign of the “Due Sicilie” between the XVI and XVII century, masserie were rediscovered in the 90’s when they underwent an intense restructuring and development process. Today, the Masserie in Puglia are delightful places in which one can spend a relaxing holiday, a romantic getaway, a historic break or an unforgettable adventure in a place immersed in history and in the roots of a which is an all-embracing and welcoming atmosphere. The following is a shortlist of the most beautiful and intimate places in which a couple can get married in Puglia. One of the most fascinating places to celebrate a wedding; a welcoming and intriguing place, so fitting for such a special occasion, saturated in the rich colour and warm aromas of Mediterranean herbs. In close proximity to Monopoli, a traditional town in the heart of Lecce, Santa Teresa Masseria is a romantic place which offers a fantastic photographic backdrop to capture the precious moments which can only be witnessed on such a unique and special day. Originating in the 500’s, Masseria Torre Coccaro is one of the most romantic places to celebrate a wedding. In keeping with time-old traditions, the masseria offers photographers with a keen eye numerous and magnificent photo opportunities: an antique chapel built in the 1700’s the internal courtyards, typical of the era in which they were built, a symbol of the past, an eternally enchanting ancient olive grove, a fabulous swimming pool and a beach with powder-fine sand, surrounded by historic sand dunes. 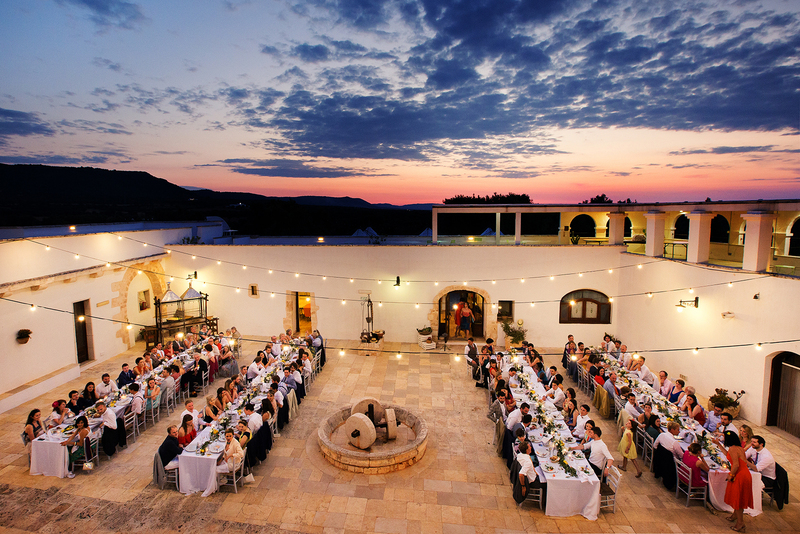 Masseria Torre Coccaro is a real treat for a bride and groom and their wedding party. Magical moments, a romantic atmosphere and historic charm are all features of this heavenly location. It is the combination of these factors which make Masseria Montalbano the ideal place to celebrate a wedding in Puglia, a location captured in a series of shots on one of the most special days for a couple. Montalbano masseria is a farmhouse village originating from the 16th century which has undergone a meticulous renovation. Montalbano village in Ostuni is surrounded by fortified walls which contain a good twenty hectares of land on which is the most delightful cultivation of ancient olive trees. It is still possible to experience the lifestyle of what once was a farming community; from the lavish elegant dimora, the captivating church, the splendid stables and the ancient olive mill to the living quarters, all places which do not fail to capture the well- trained eye of a professional photographer. Masseria Montalbano will win over couples who wish to celebrate their nuptials in a place where rustic charm meets refined elegance. The familiarity of the environment is enriched by the elegant atmosphere; ancient history is palpable throughout, the rugged nature; that’s why Masseria Torre Ruggeri is one of the most fascinating locations for an unforgettable wedding in Puglia. A traditional farmhouse, typical of Southern Italy, with its tower dating back to 1606, the ancient courtyards, the ancient olive groves and a magical citrus garden, Masseria Torre Ruggeri is a place where historic culture meets the elegance and sophistication of today’s society. It is this harmonious combination which makes it such an ideal location for a wedding day. is an ancient and elegant Salentine masseria originating from the 1500’s, carefully restored back to its former glory with expert skill and mastery. Within walking distance from Lecce, Masseria San Lorenzo gives the bride and groom the opportunity to experience their romantic journey in an enchanted paradise. Avenues immersed in greenery, the magical atmosphere of the garden, the history and tradition of Salentine culture, the essential but never predictable sophistication of the location make San Lorenzo a magical location to celebrate a wedding day. The intense perfume of wild rosemary, the scent of oleanders and the fresh sea breeze, a charming and long tree-lined avenue; this is how Masseria Montenapoleone welcomes you in a place out of the ordinary and immerses you in a wonderful experience. In the heart of Puglia, this fortified farmhouse dating back to 1600 still retains its irregular structural borders, the ancient olive groves and the typical vineyards of this warm land are further enhanced by a modern and elegant décor. 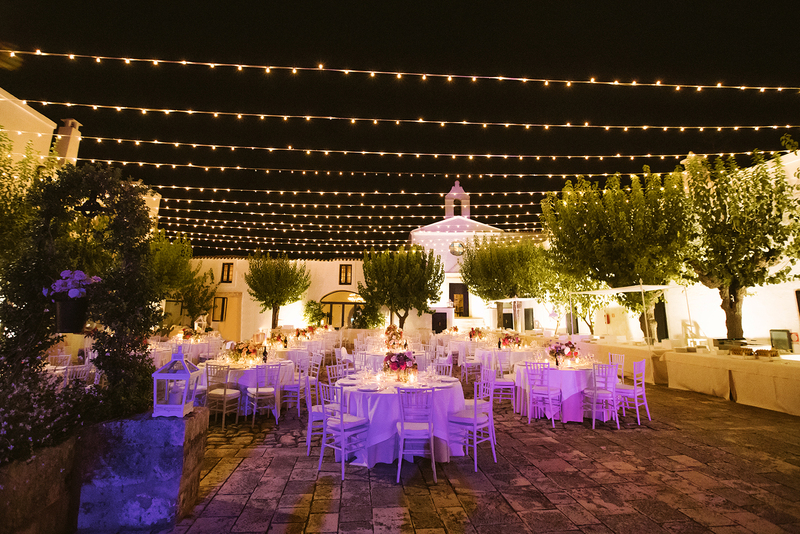 Masseria Montenapoleone is a fairytale place in which to celebrate a wedding in Puglia. Masseria San Nicola, is a small, typical Apulia village located in Fasano, in the province of Brindisi. Built by the Prince of Carbonelli in around 1600, the Masseria was then later bought by the Camicia family in the 1800’s who used it as a summer dwelling. The original name of the Masseria was “Masseria delle Seti”, later changed to “Masseria San Nicola” as a sign of devotion to the patron saint of the city of Bari, capital of the Apulia region. Masseria San Nicola is now a fantastic wedding venue with its nineteenth century garden typical of villas and manor houses throughout Puglia: surrounded by walls and paths in which one can take a stroll, the rich scents and colours of wildlife prevail, making it a magical scene for memorable photos. 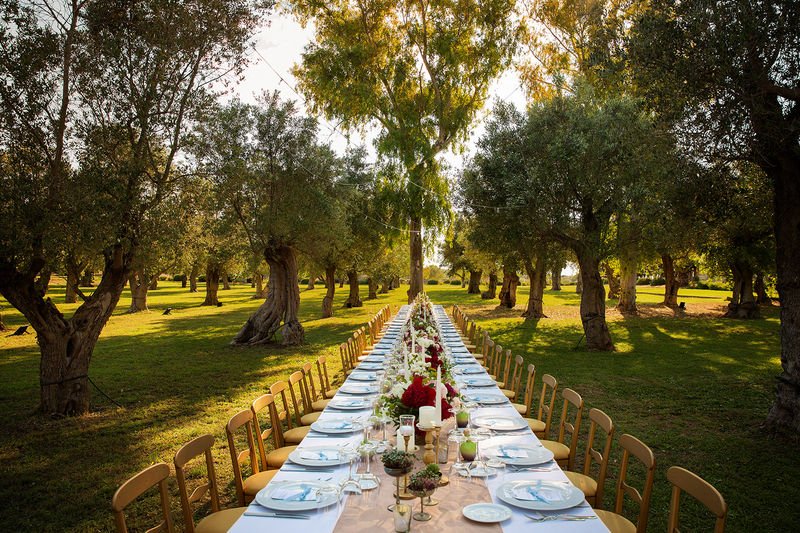 If your dream is to celebrate your wedding day in a refined and elegant location, immersed in a typical and romantic landscape in the Puglian countryside, look no further than Masseria Luco. Built between the eighteenth and nineteenth century, it is an ancient masseria immersed in a beautiful and vast forest and is characterised by an original architectural style, typical of the ancient rural buildings in Puglia. The Masseria, in fact, is a kind of small rural village, in which you can organise a charming itinerant marriage throughout the various areas. The interior is decorated in an elegant and refined style, combing classic with modern, while the exterior is characterised by large spaces, a relaxing garden and a beautiful swimming pool. A charming consecrated chapel featuring frescoes from the late eighteenth century to the beginning of the nineteenth century is available for a religious ceremony and makes a wedding in Masseria Luco just that little bit more special. Where can you go to experience a fairy-tale wedding in Puglia? Masseria Papaerta could be just the place for you; situated in the hills, between trulli, stone buildings, ancient dry walls and typical rural landscapes. 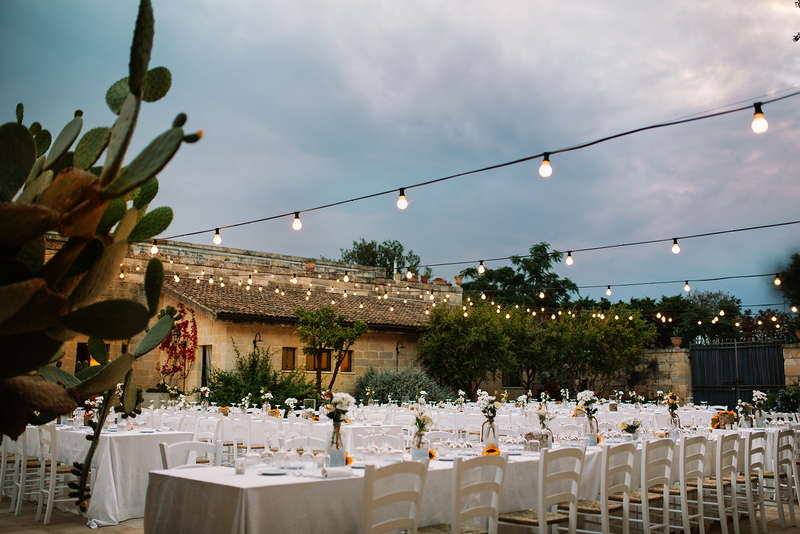 Everything here harks back to the history and tradition of Puglia, the atmosphere is magical and the location, with its lights and historical buildings with refined modern furnishings make this masseria a truly fairytale place for a wedding day. An authentic location where you can celebrate a wedding day and live unforgettable joyful moments with friends and family. The Masseria Casamassina, in Ostuni, in the province of Brindisi, is characterised by the careful restoration and conservation which has taken place there. The original and typical Apulian architecture, the meticulous attention to detail, the romantic atmosphere, the fascinating location, everything that contributes towards a fairytale wedding in Puglia. Are you looking for a photographer who captures the emotions of your wedding day in Puglia?